Well, our long trip down Angel Love way has finally come to an end in this extra-sized Special... but that's not the end of Angel Love talk from me. Nope. 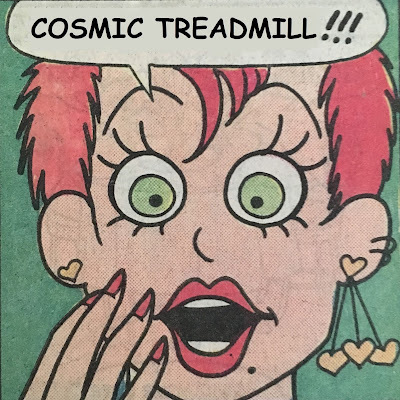 I'll remind y'all again, Reggie and I will be discussing this entire run on this week's Cosmic Treadmill segment on the Weird Science DC Comics Podcast. That's Episode 88 if you're reading this in the future. Picking up where we left off... a balaclava'd Angel is holding Congressional hopeful Maureen McMeal at gunpoint... which doesn't last all that long. Maureen knows it's Angel, and knows what she's being "held up" with is a water pistol. She invites Angel to "fire away" as she lights up a smoke... and she does! Brain-matter and gore are all strewn... er, okay... it's a water gun... Maureen Beth just gets a little wet. Maureen says she'd be more than happy to help their mother... but not until the election is over. Ya see, she's stated publicly that her entire family died in a plane crash... she can't be the "honest" candidate and have it come out that she lied about her tragic past. Turns out, as we dig a bit deeper that her past was already tragic enough. Her and Angel's father molested her. That's why she left Scranton! We learn that she was homeless for awhile after making it to New York... but by the help of a special Social Worker was able to work her way up to where she is today. Maureen ends the conversation... hops back into bed, and shuts off the light. Angel's no longer playing around... she goes all "hardball" and threatens to go to the press. Knowing that the jig is up, Maureen's got no choice but to comply. Meanwhile, Angel and Maureen Beth are using a Port Authority helicopter (ol' MB's got connections, and she ain't afraid to show 'em off). Maureen calls campaign headquarters and gives the skinny to one of her aides... the actual truth too! Unfortunately, some skeevy phone-tapper is listening in... this probably won't end well for Ms. McMeal. Back at the pad, Wendy is singing for her audience of cockroaches and birds... who all scatter when Everett knocks on the door. Wendy suggests she and Ev talk about what they're going to be when they grow up. This ticks off and already ticked off Everett who gets all "pointy" and informs Wendy that she is in fact... a grown up. This may be my soft-spot for Wendy speaking here... but, Everett's layin' it on a bit thick here. Anyhoo... Wendy takes his lecture as a sign she should give up the movies and theater... and just become a television star! Meanwhile, Angel and Maureen Beth arrive at their mother's bedside. MB's thinking she'll be in and out within the hour, as she doubts she'll be a match. Wrong-O McMeal... you might just be a good candidate for something yet! Meanwhile again... we rejoin Everett... now in full Michael Jackson "Beat it" get-up. He's trying to woo Lola back the only way he knows how... buyin' her stuff. I'd have loved it if Lola told him to "beat it", but no... he knows the way to her heart... gaudy jewelry! Back in Scranton, Maureen's all done giving marrow... and she's ready to split town. Doctor Chin advises her against it... but MB's gonna MB. As she hits the sidewalk, she is met by a massive press gang all wanting to know why she's a lying liar that lied. We jump ahead one week as Angel and Wendy are talking on the phone. Angel's chosen to remain in Scranton for the time being while her mother gets back on her feet. Wendy offers to pay Angel's rent for the month because her rich daddy gave her "a raise" for taking a "pay cut" as a television actress. Angel flips on the television and we learn that Maureen McMeal... lost the election. They cut to her concession speech where she plays up her choosing family over politics. Right after the speech ends... Angel's phone rings. Why, it's Mary Beth... who just lays into her, and tells her she's going to disappear for awhile. And, we close out for good on Angel's reaction. Let's discuss this issue before we take an "overall" look at this series... which, was always meant to be this length... it wasn't cancelled. In so much of my research, I kept seeing it mentioned that this was canned after only eight issues... however, those wacky house-ads that they ran during the Summer of 1986 stated that this was a "special eight issue series". So, if we look at it that way, it was actually given an extra issue to wrap up. All's well that ended well here. Angel's mom survived, at least for the time being... Everett and Lola are still an item... Wendy's rich dad gave her a raise for slummin' it in television... Pregnant Cindy is starting to show... and the Balloon restaurant has apparently lifted it's "no live birds" ban. I suppose the discussion-worthy thing about this final chapter is the (dark) revelation of why Mary Beth flew the coop, and disowned her family. I had a sneaking suspicion this was coming... and it's really hard for me to comment on it as a storytelling device. Looking at this through 2016 eyes... I just see this as a well-worn trope. Back in 1987, this sort of thing was far more novel... at least as it pertains to comics. It is interesting to note that this was the only issue of this series to come with a "For Mature Readers" warning. Poor Maureen/Mary Beth winds up losing the election because she's a lying liar that lies... you'd figure the "saving her mother's life" thing would have carried her through, but what do I know? I'd have to assume McMeal was running on the Democratic ticket in New York City... so she really must have ticked off her prospective constituents, for them to vote against her. Angel winds up not quite where she started from. She's back to being something of a newcomer to the "big city"... but now, when she arrives she has people waiting for her... and celebrating her arrival. We get a deeper look into Angel and Wendy's relationship... which I was actually pretty curious about. They appear to be somewhat close... at least to the point where they end their phone calls with "I love you". I'm kinda scrambling for things to say here. I gotta admit, I'm kind of unsatisfied with this ending. It's... I dunno, just another issue... I guess. The bone-marrow caper is wrapped up, and the election is over... yet, I still feel so little in the way of closure. As I read through this series, I figured it was going to end with a wedding... or a funeral... or childbirth. Those would have felt more "endy" than this did. This just... ends. Overall... is Angel Love worth your time. Hell yeah. I may not have dug the way it all "wrapped up", but I had a great time reading this... and I find that I will miss these characters... some more than others, obviously... but this is really a charming crew, and the whole shebang would have felt incomplete without any single cast member. I don't know where the rights lay with this property... so I wouldn't even begin to know whose cage to rattle to get this collected... or released digitally (not that my voice is all that loud to begin with). Not sure if that's a DC Comics thing or a Barbara Slate thing... either way, this series deserves to be readily/easily available for any curious enough to give it a flip through. Thanks for reading this along with me... this was a fun experience... books like this are kind of the reason I started the humble blog. Shining what little light I can offer onto some underappreciated gems of yesteryear. Also, thanks to Ms. Slate for taking us all along for this ride. Check out the shout out to graffiti legend Lady Pink on page two of the letters column! Wow, who knew after all these years that there would still be this kind of appreciation!! I am actually the original ILLUSTRATOR and inker of Angel Love. It was a highlight of my early career in NY. I was primarily a cartoon animator (worked for Disney and on The Simpsons). I am currently retired but still do cartoon illustration and have prints for sale on Etsy. Actually, Angel Love was not meant to be a finite 8-issue series. It would have continued but apparently wasn't popular enough, or DC considered it too controversial, or both, which is why Barbara Slate had to wind it up. Hello Mr. Lopez, thank you for stopping by! That's good to know. I only went by the house ads that came before it, which called Angel Love "A special eight-issue series about the troubles and triumphs that make us all heroes." Thanks again for stopping by! I really enjoyed Angel Love, it's been a definite highlight for me in maintaining this blog!